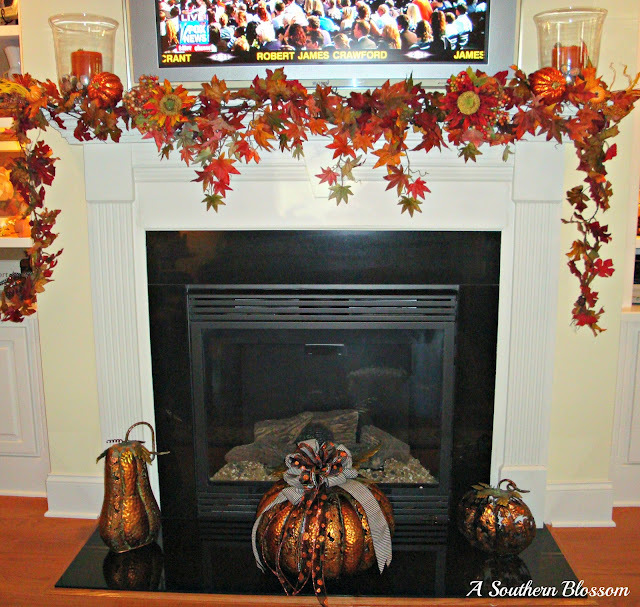 Let me begin by saying I love Fall and I especially love to decorate the house for Fall. The local stores are starting to feature Fall decor and I even noticed some Christmas items even though the weather in the South is still very hot and humid, which started me reminiscing, so please join me as I take you on a tour of my home from last Autumn. 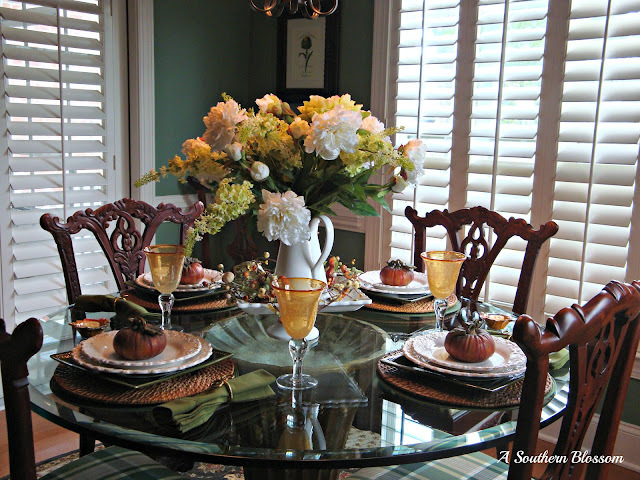 The breakfast table is even set for Fall with ceramic pumpkins and amber colored glasses. Touches of Fall can be seen on nearly every surface of our home. 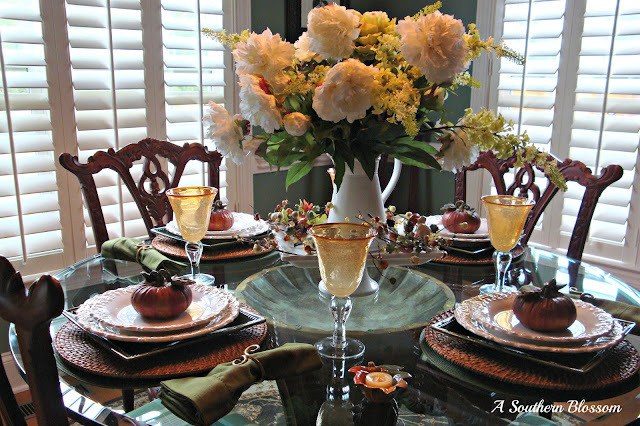 The pheasants were a purchase from Hobby Lobby and landed on the sofa table. 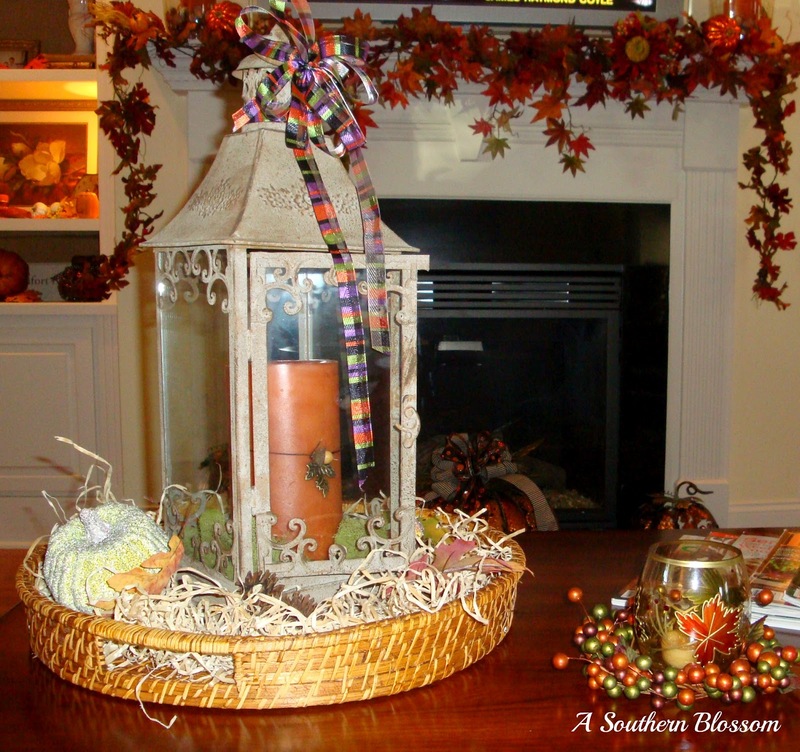 The lantern is nestled in a wicker tray filled with pumpkins and fall colored leaves scattered about on the coffee table. 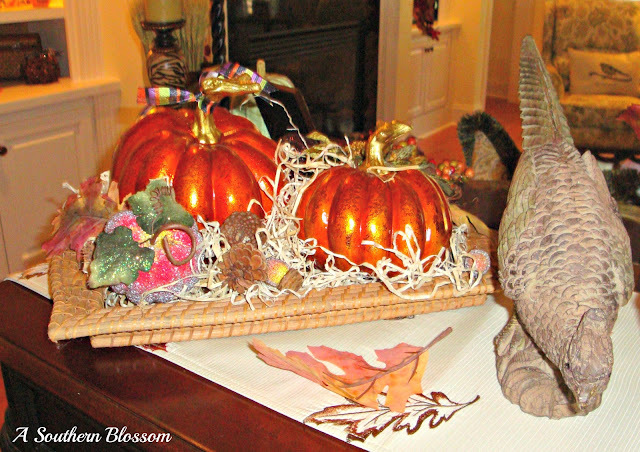 This pumpkin is rather large and sits in front of the fireplace. 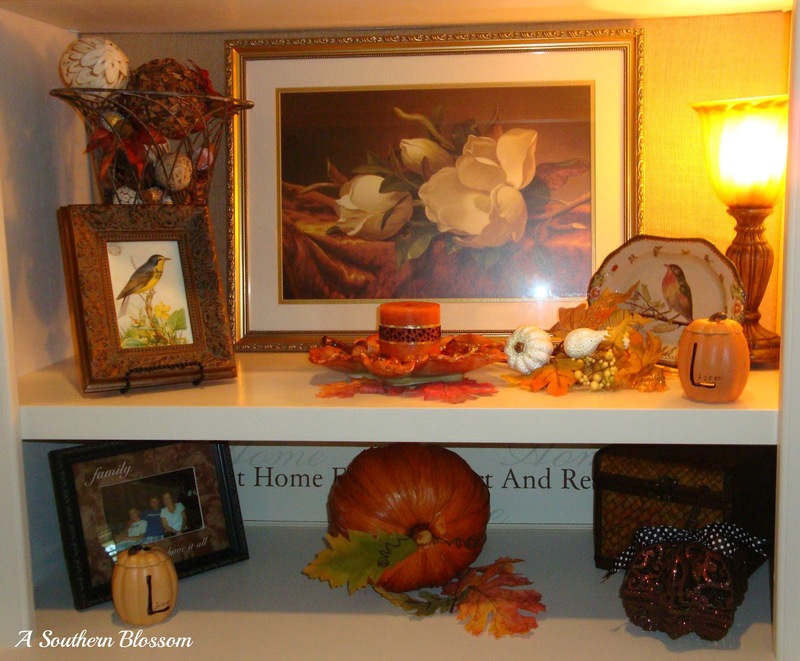 As you may know from reading my blog I don't have much mantle decorating space(MDS), but I make the most of my limited space. 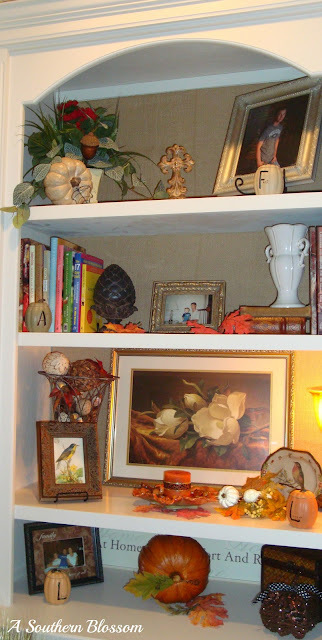 The bookshelves are backed with burlap fabric, and I must admit Mr. SB did a great job helping me with that project. The bookshelves also make up for the limited MDS! 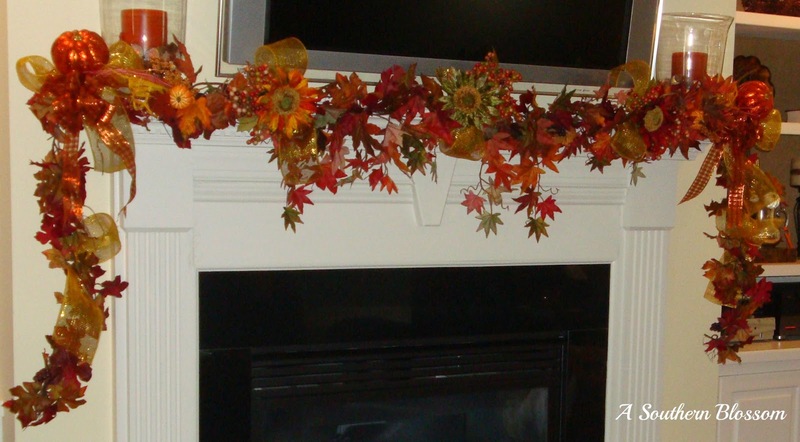 The entry is decorated with a cornucopia and a Fall color piece of fabric. The pinecone pumpkin has been with me for several years and is a favorite. 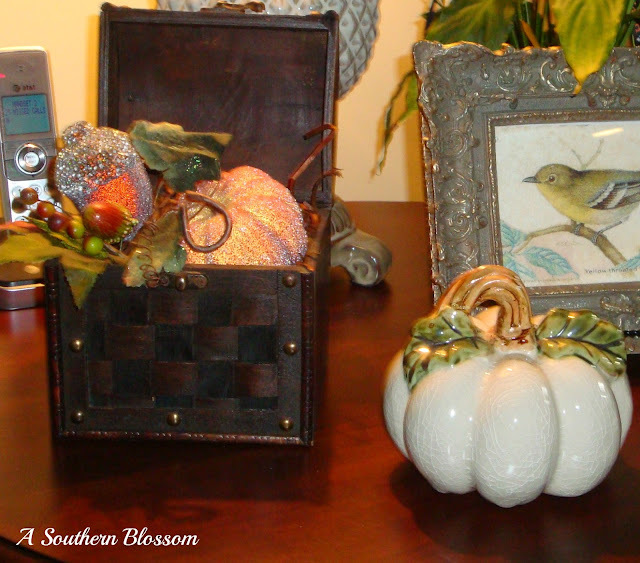 Just a few picks and a pumpkin added to a box help create this vignette. Another view of the sofa table. A side view of the mantle. 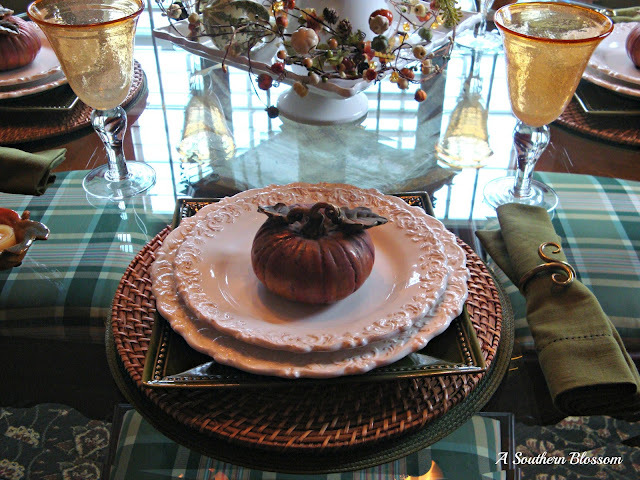 The dinning room table set for six, I don't usually add the extension till Thanksgiving Day. 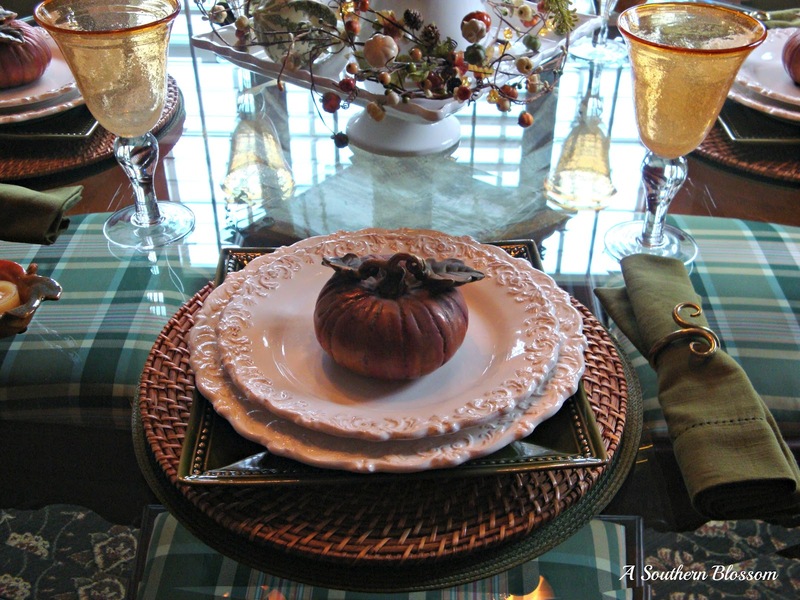 No truer words...lots of food to eat during the holidays! 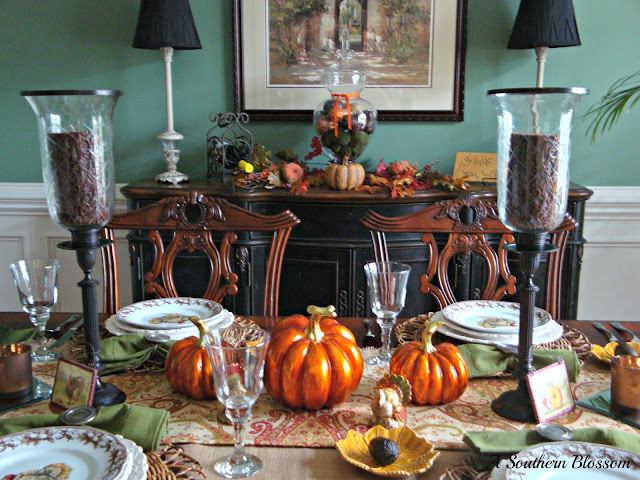 All the lovely shades of Autumn come together in the dinning room. 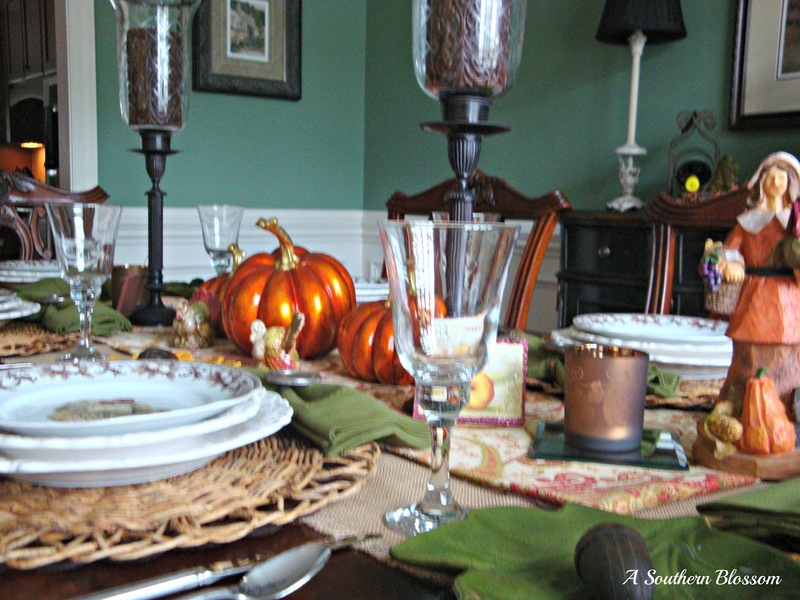 Orange, gold, amber and green. 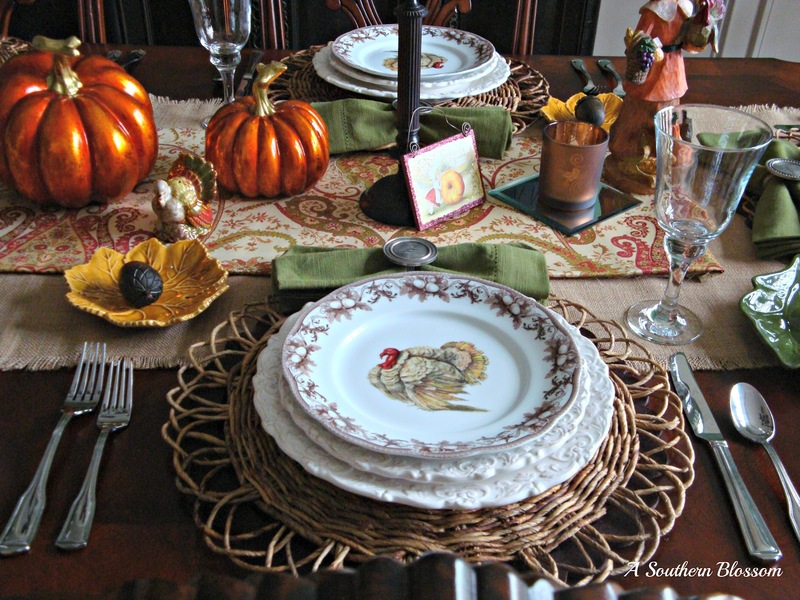 The turkey plates were purchased from William Sonoma. I really like the simplicity of this tablescape. 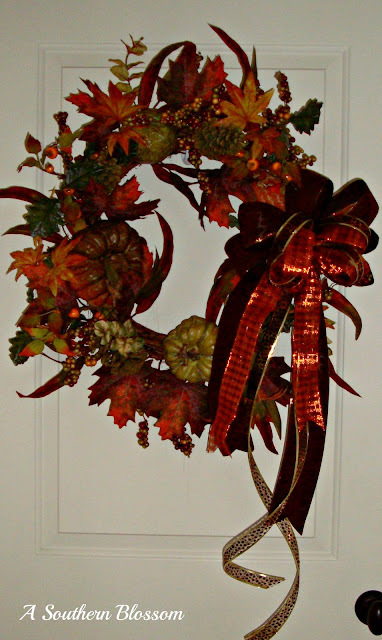 The bow was added to the store bought wreath and hung on the door to the laundry room, like I said Fall all around. 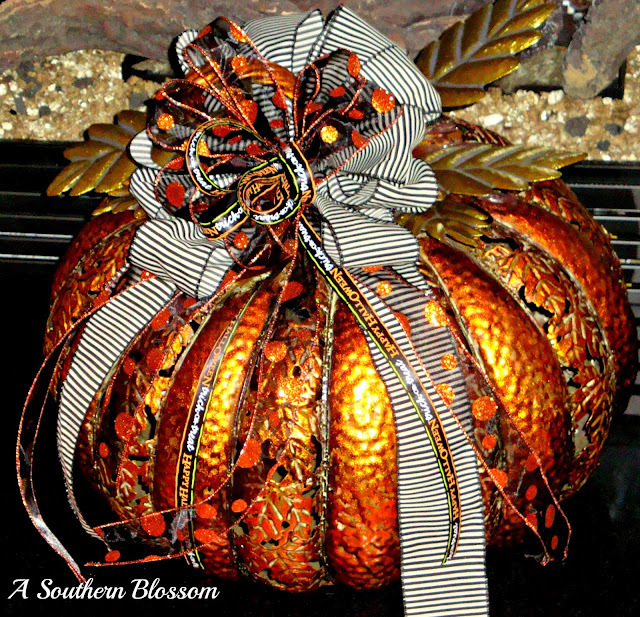 Thank you for stopping by A Southern Blossom I hope you enjoyed my Fall decor from the previous season and I look forward to sharing with you my ideas and creation for the upcoming Autumn. Karen, you had such pretty fall decor in your home last year. I can't wait to see what you do this year. I see all of the pretty fall decor in the stores; and I am more than ready to start! 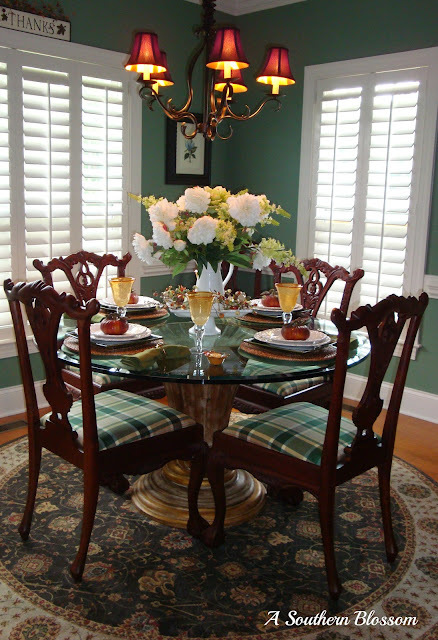 Your home is very beautiful! 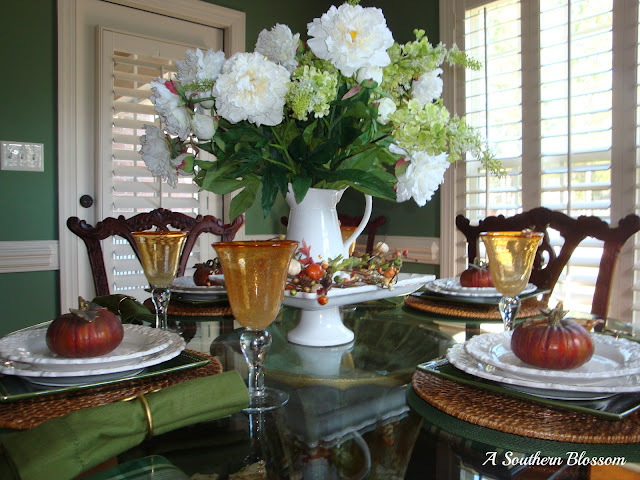 Your buffet is very similar to mine, as is your kitchen table. I guess we both have good taste. lol Your Fall decor is so pretty! 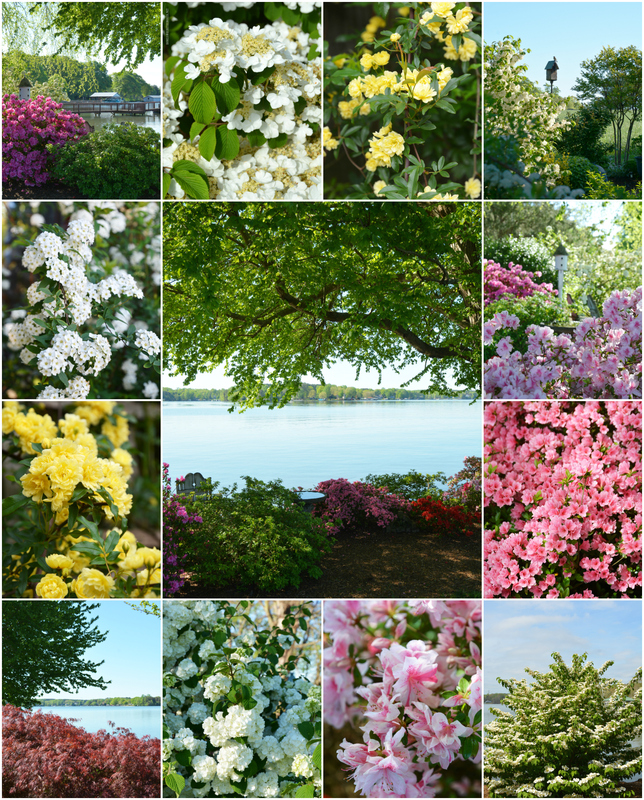 Loved looking at all your vignettes. 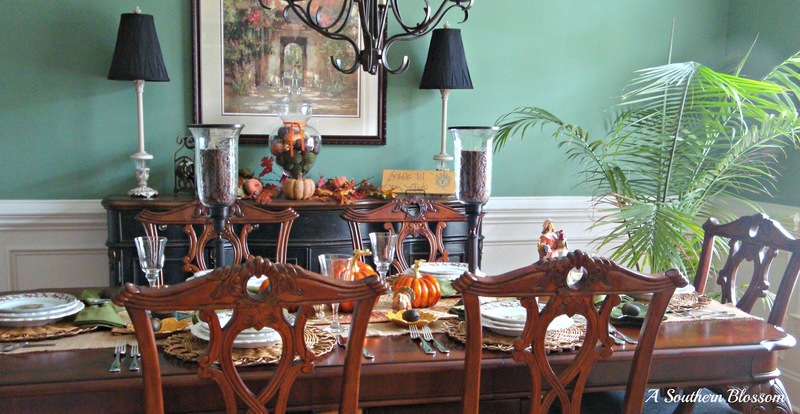 I'm ready for fall too. Especially after seeing your beautiful photos! 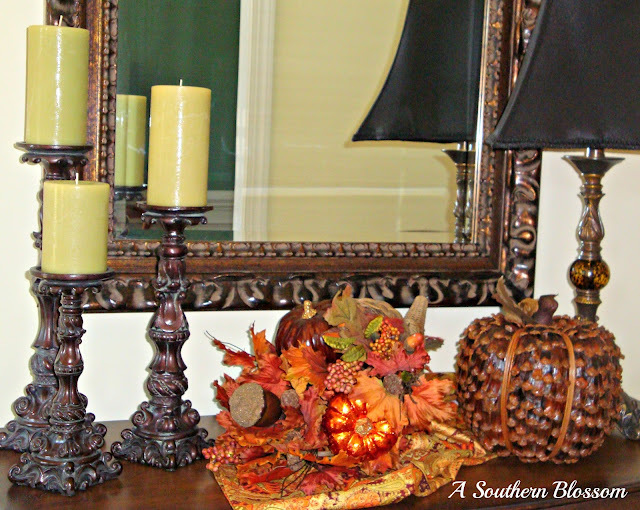 Your fall touches look beautiful! Love the garland on your mantel. Oh my gosh! This dining room is amazing too! 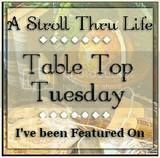 I'm so glad I ran across your blog today...you've got some fantastic inspiration here!